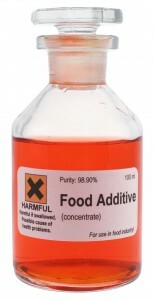 Six Food Additives That May Set Us Up for Failure! Britain researchers recently conducted a study regarding the effects of food on children’s behavior. The children who consumed more sugary foods with artificial coloring and other additives experienced 720 total accounts of undesirable or bad behavior compared to the 120 accounts of bad behavior exhibited by the children who consumed healthier foods. Physical aggression, hyperactivity, and a generally poor disposition comprised the bad behavior. That equates to a difference of 600 bad behavior incidents correlating with the bad food consumed. Not only does food contribute to behavior, it plays a significant role in mental health. Food aids in the development of short and long-term memory as well as contributes to the development, management, and prevention of several mental health diseases. So how can we increase health prevention and decrease deteriorating development? The answer isn’t surprising: By consuming balanced with sufficient amounts of proper nutrients. Many food additives provide zero nutritional value, yet they are popping-up in approximately 80% of all foods to increase shelf life or enhance taste and appearance. Artificial sweeteners. We tend to think “sugar free” and “diet” equate with “healthy,” however this isn’t necessarily true. Foods listed as such can be incredibly bad. Aspartame has been linked to contributing to many mental illnesses where short-term memory is affected. Artificial sweeteners have also been linked as a possible cause of glucose intolerance. Aspartame is found in diet sodas, desserts, sugar free gum, baking goods, and the list continues. In general, be wary of any food with a “diet” label, they may not be as healthy as we think. High Fructose Corn Syrup. The majority of calories in processed foods can be attributed to this highly refined artificial sweetener. It is also used as a preservative to maintain foods’ appearance and freshness integrity while increasing shelf life. It is estimated that average American consumes approximately fifty-two pounds of high fructose corn syrup annually according to the U.S. department of Agriculture. Frightening! MSG (Monosodium Glutamate). This flavor enhancer overrides pathways in the brain that eliminate satiation signals, which are how your stomach communicates to the brain that you are full. This can lead to frustration at the inability to feel satisfied and can be directly attributed as a leading cause of obesity. MSG can also produce short-term symptoms including numbness, burning sensations, and facial tightness in those who are sensitive to the additive. Food dyes. Their main purpose is to add visual appeal to products. Junk food would definitely be perceived to taste different if it was grey in color, compared to their vibrant hews. There is a substantial controversy surrounding artificial food dyes, with Red dye #40/FD&C Red No. 40/Allura Red/Red 40 causing the most concern. This artificial color ingredient has been linked to behavioral issues in some children as well as other concerning illnesses. BHA & BHT (Butylated hydroxyanisole and butylated hyrdoxytoluene). These preservatives keep certain foods, such as cereals, chewing gum, potato chips, and vegetable oils from changing colors, flavors, and helps sustain their shelf life. Foods containing BHA/BHT tend to lack Nutritional value as this additive offers no perceptible health benefits. Potassium Bromate. Notice the size of your bread loaf recently? Chances are the larger volume is due this additive. Potassium Bromate has been associated with certain digestive disorders. Though many popular brands, including Pillsbury and Pepperidge Farms, no longer use this ingredient, and have switched to non-bromated flours, it has not yet been banned in the U.S.
With all the information connecting food additives and health problems, more Americans should be paying close attention to their food purchases and what they contain. The Research Group’s team of behavioral experts can help you identify buyer rationale, and POBA’s on health, food, and many other pertinent categories. Market research is formalized listening, so let’s put forth the effort to listen to our bodies and how they react to the fuel we choose. This entry was posted on Tuesday, October 7th, 2014 at 4:56 pm. Both comments and pings are currently closed.